Book review: Water, weed, and wait. Water, Weed, and Wait – Edith Hope Fine and Angela Demos Halpin (illustrated by Colleen Madden), 2010, Tricycle Press, Berkeley. There’s an encouraging and inspiring trend going on in North America: getting children to dig in the dirt and learn about food and horticultural plants through community and school gardens. Whether parents or teachers are leading the projects, the emphasis is always on fostering community involvement: entire families or neighbourhoods may help out with the gardening duties in fun social events that take the shape of work-bees. I even came across a project online at City Farmer where students of an elementary school and the retirement home next door joined forces, in North Vancouver. If the growers don’t consume the produce themselves, it may be donated to those in need, or used in restaurants or cafeterias, or sold as part of CSA (Community Supported Agriculture) shares. And, from start to finish, the growing season is full of lessons for both adults and children – there’s simply nothing better than an outdoor classroom! 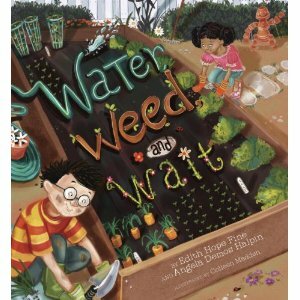 Books like Weed, Water, and Wait celebrate the “school garden” movement in a big way. Full of bold, bright, and extremely colourful illustrations, this children’s picture book is ideal for introducing the idea of a school garden, to get the ball rolling before actually doing the work. In it, a master gardener appropriately named Miss Marigold leads her student charges – and a whole host of adult helpers – in building a school garden, literally from the ground up. Along the way, a curmudgeonly neighbour named Mr. Barkley lends comic relief with his grumpy “hmmmmphs,” while Miss Marigold teaches valuable lessons about “worm poop” (her words, not mine) and beneficial insects. Great, snappy writing and catchy repetition of key phrases and concepts (as well as a silly song about veggies and fruits, sung by a certain character in a carrot costume) make the book ideal for reading aloud. The lessons in the book can be taken out of the context of “school gardens” and can be applied to any gardening venture, even a tiny container garden or raised bed at home, so don’t be afraid to try the book out on the little ones in your life. (Maybe wait until spring, though, or you’ll have a whole lot of “How many more sleeps until I can plant the peas and carrots??!!”). Have you ever travelled to another country (or a geographical region other than where you live) and felt awestruck by how good the food and drink tastes, how different it is from the food back home? A friend of mine was recently telling me about her travels in France, and she was practically salivating at the memory of the amazing cheeses she sampled while there. She kept repeating that they did not taste like any we could buy here in Canada, even though we have some pretty fabulous cheeses here. Of course, she was probably eating varieties that are not common to our Canadian palates, and therefore she couldn’t really compare them directly, but it’s true…there is definitely something to the way food tastes in a particular area. It’s one of the reasons the country of France is renowned for its cheeses. It’s also one of the reasons California wines taste differently than those from Australia, or Chile, or here in Canada, even though the same varieties of grapes may be used. And it has nothing to do with your individual preferences, or the fact that everything tastes better when you don’t have to cook! Appropriately, the French have come up with a term for this idea: terroir. It’s a notion that originated out of and is still primarily reserved for viticulture, although it is creeping away from the vineyards and is now being used to describe certain foods, as well as tea, coffee, and beer. Meaning “a sense of place,” terroir refers to the idea that geography informs taste: everything, from the quality of the soil, light conditions, air quality, to climate – basically, all of the natural elements that influence how plants grow – will affect the taste of food crops from a particular region. It’s simple, really: taro root grown in a ditch near a heavily forested area on the island of Rarotonga, for example, likely won’t taste quite the same as that grown in a boggy field in Brazil. The soil is different; so is the quality of the rainfall and of the air. As well, on Rarotonga, the ditch may shaded by a canopy of a large tree, shading the taro, whereas on the farm in Brazil, the sun beats down, hot and heavy, nearly every day. All of these things will impart certain flavours to the produce. So it is with wine-making. (In viticulture, the concept of terroir may even embrace the microclimates formed by the very rows of grapes in a particular vineyard – it’s not just about provinces, or states, or territories, or entire countries). What’s more, if you take that bottle of wine from Burgundy and transport it anywhere else in the world, it should still taste of the terroir inherent to Burgundy – no matter if it’s opened and consumed in Alberta, or in Tanzania. Cheese, of course, doesn’t grow on trees. (Although the world would be a much better place if it did!). On a trip to Maui, my husband delighted in the steak he had for supper one evening. While it didn’t quite equate with good ol’ “Alberta beef,” he remarked that it had a subtle sweetness that our beef did not. Our server informed us that it was due to the fact that some of the cattle on the islands graze on sugarcane, which imparted an extra bit of zip to the meat. (Whether or not this is just some line proferred to Canadian tourists, I don’t know – really, it could have just been the different water. Or the proximity of the ocean). Regardless, Hawai’ian beef isn’t the same as ours, even though the breed of cow may have been. The same goes with cheese: whatever the cow or goat eats, that flavour is imparted to the final product. A bovine munching on some sweet clover may ultimately lend its milk to a cheese that tastes completely different than that from a cow that eats wild fescue…and the sweet clover or fescue grown in one place may not taste exactly like that grown in another! (Just think of all these wandering foodie cattle, seeking the next “big thing” when it comes to their forage!). Of course, it is also imperative to consider the methods of preparation of the food or beverage: not all cheese or wine or beer is created in the same manner, and flavour is definitely something which can be manipulated during processing. 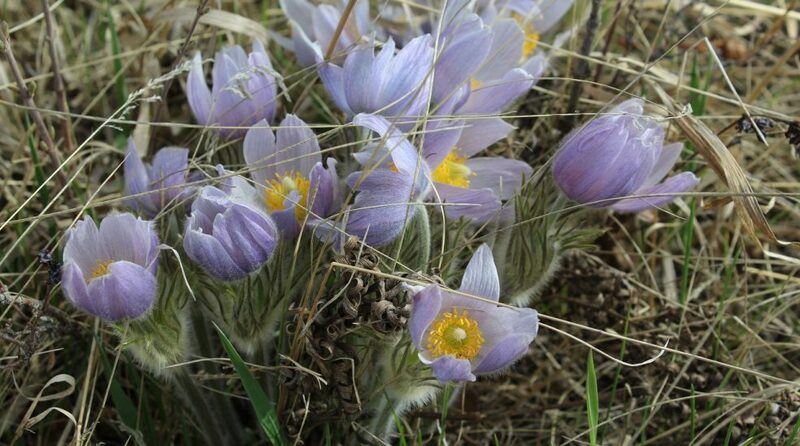 And, obviously, different cultivars and varieties of plant species are going to provide varying results as well. The point is to acknowledge how growing with regional base “ingredients” (soil, water, light, air, etc.) can make such a world of difference!